Russia’s Rostec state corporation is in negotiations process with Saudi Arabia and Kuwait on the delivery of T-90 third-generation Main Battle Tanks, Rostec CEO Sergey Chemezov said in an interview Tuesday. “Saudi Arabia and Kuwait show great interest in our tanks and we are discussing the possibility of acquisition by these countries,” Chemezov told Rossiya-24. T-90 is the third generation Russian tank known for its fire power. Its export version includes fragmentation projectile with remote detonation to cause further havoc in adversary’s ranks. The T-90 entered service in 1993. 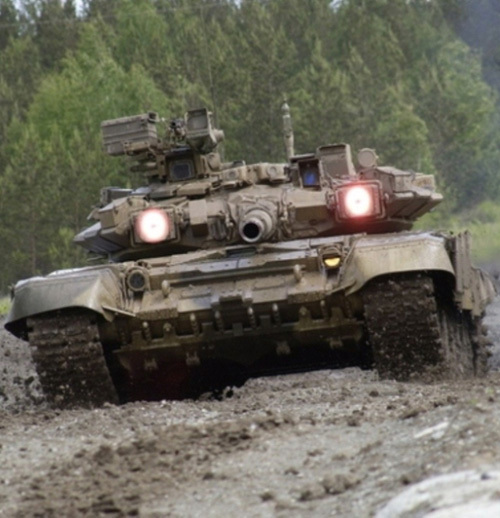 The tank is a modern variation of the T-72B and incorporates many features found on the T-80U. It was shown for the first time outside Russia in March 1997 when it was demonstrated in Abu Dhabi. The T-90 uses a 125mm 2A46 smoothbore main gun, the 1A45T fire-control system, an uprated engine, and some vehicles thermal sights. Standard protective measures include a blend of steel and composite armor, smoke grenade dischargers, Kontakt-5 explosive-reactive armor and the Shtora infrared ATGM jamming system. It was designed and built by Uralvagonzavod, in Nizhny Tagil, Russia. Since 2011, the Russian armed forces have ceased any further orders for the T-90, and are instead anticipating the development of the T-14 Armata.